Consider how the book dissects the decision-making process. 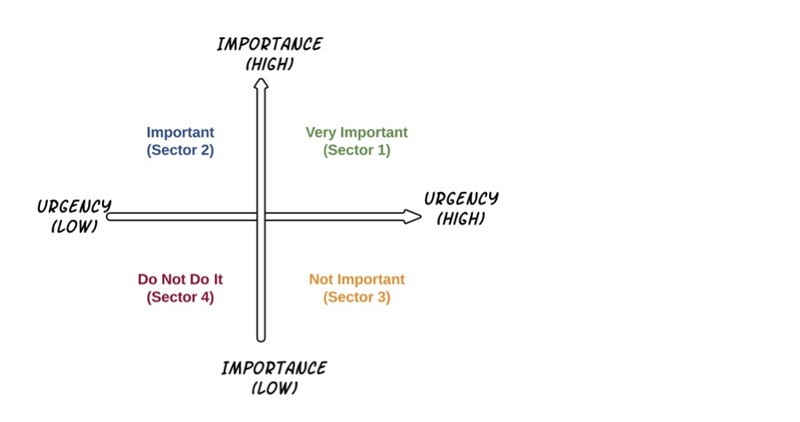 Covey uses a time management matrix attributed to former President Dwight D. Eisenhower to categorize tasks based on how urgent and/or important they are. Below is a variation of that grid I’ve created that can help prioritize key steps in saving for retirement. 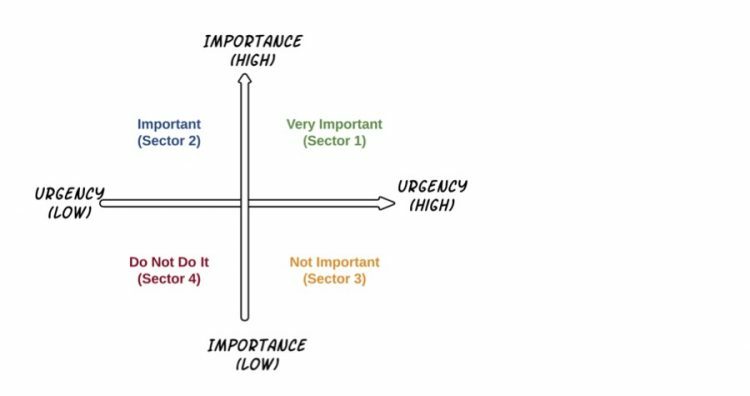 To be successful, it’s most critical to take the steps in this quadrant. • Start early. Begin contributing to your retirement accounts early in your working life. The longer those deferred dollars are invested, the more growth you’ll achieve, and the more money you’ll have when it comes time to retire. Ideally, you’d contribute the maximum allowed by law, but there’s no perfect amount. Saving about 10% of your salary, or enough to get your 401(k) match — if your employer offers one — are both good goals. Let’s say that your employer provides a 100% match for the first half of your contribution and a 50% match for the second half. If you defer 6% of your salary, or $100 per pay period, your employer will deposit an additional $75 in your account. That’s free money! • Save tax efficiently. 401(k)s, IRAs, 403(b)s and other retirement plans allow you to make tax-deferred contributions. You’ll pay taxes on distributions only when you retire, unless you have a Roth account. This reduces your taxable income while you’re working and increases it during retirement, when you’ll likely be in a lower tax bracket. • Have the right mix of equities and fixed income. Your asset allocation dictates the level of risk in your portfolio and should change over time. In general, your portfolio should have more stocks than bonds while you’re young, As you approach retirement, your allocation should become more conservative and favor bonds. If you retain too much risk and the market tanks shortly before you retire, you may be forced to work longer to allow your accounts to rebuild. Or you may have to live on less than you had planned during retirement. • Use low-cost investment options. This will help you earn better returns over the long run than if you’d used high-fee investments and accounts. According to the Department of Labor, in certain instances, paying an additional 1% in fees in your retirement accounts could reduce your savings at retirement by 28%. Experts recommend that investors aim to keep fees, represented by the fund’s expense ratio, below 1%. Although low-cost index fund fees may be just a fraction of that, actively managed mutual funds can cost almost double. If your 401(k) doesn’t offer a great selection, roll over your account to an IRA if you change jobs. IRAs often have more investment options and lower costs. Take as many of these steps as possible. They may not be as urgent as the actions in Sector 1, but they’re extremely important to funding your retirement. • Gradually boost your contribution amount. If you can’t afford to contribute 10% of your income to a retirement right now, find ways to increase your savings over time. For instance, you can increase the percentage of your paycheck that you contribute to your 401(k) by 1% each year until you reach an adequate rate for your goals. You can also increase your deferral amount when you get a raise. Commit half of it to your retirement account and take the other half home. • Practice tax diversification. It’s a good idea to save in tax-deferred, taxable and tax-free accounts so that you can choose what funds to use during retirement. Establish a Roth IRA — which offers tax-free growth and withdrawals — if you can, but also use taxable investment accounts, which can fund goals other than retirement. • Contribute regularly and over a long period. Don’t suspend retirement contributions when the markets are going down. The more you consistently contribute over a long period of time, the more likely you are to meet your retirement goals. This step is not necessarily important to your saving goals, but it’s important to take care of for the sake of your heirs. • Check your beneficiary designations. Make sure that the primary and contingent beneficiaries on your retirement accounts are up to date. This is urgent, since we never know when we’re going to die. It may not help you fund your retirement, but it will help provide clarity and support for your heirs. Resist the impulse to make moves that can have a negative impact on your retirement funds over time. • Avoid checking your retirement account balance daily, weekly or even monthly. When you invest for retirement, you’re investing for the long haul. Short-term market fluctuations are bound to occur, but they’re unlikely to impact your balance at retirement. And checking your balance might tempt you to cash out when the market tumbles and reinvest when it recovers, which is a terrible thing to do. Selling when your portfolio declines locks in the loss and means you could miss out on the gains when the market rebounds. • Steer clear of trying to pick winners. Past performance isn’t a good indicator of future performance, so you might not want to invest in the two or three funds that performed best last year. Work with an advisor to pick investments based on your goals, risk tolerance and time horizon. • Tune out the noise. Don’t make retirement investments based on headlines, TV shows or a hot tip from your boss. Even the best market analysts are lucky to pick the right investments 50% of the time. You have little chance of being right regularly, so don’t gamble. Instead, invest using an evidence-based plan and a proper mix of U.S. and non-U.S. stock investments, REITs, bonds and cash. There’s plenty of work to do to meet your retirement funding goals. This grid can help you prioritize the steps you should take first. But if this seems overwhelming, look for a fee-only advisor who can help you develop and execute a retirement plan. You can find fee-only advisors through the Garrett Planning Network or the National Association of Personal Financial Advisors (NAPFA).